Cards: Score 1990 Hot Gun, Action Packed Rookies 1992. I have been really impressed with how far Boomer has come as a broadcaster since retiring, and after the fervor erupted over him as a Monday Night Football commentator, Esiason was ousted and retreated to in studio work and radio where he has really honed his skills. He technically began his commentating career along with Warren Moon and Dan Marino as color analysts for WLAF games on USA Network back in 1991. A rarity in NFL drafts, no quarterback came off the board during the first round of the 1984 draft. Boomer Esiason would be the first, with the 38th pick of round 2. A very strong draft, Wilber Marshall, Dean Steinkuhler, Irving Fryar, Keith Millard, Carl Banks, Greg Bell, and Bill Maas, were among the recognizable names taken before Esiason. It is safe to say that just with these players alone, the 1984 draft helped form the backbone in depth and classic names through the early 1990s. The pretty boy with golden hair, Boomer was a prolific passer for the quarterback manufacturing school, the University of Maryland. While there he’d set 17 school records, and is considered by many to be the greatest and most recognizable Terrapin of all time. (The Washington Federals of the competing USFL drafted Boomer as well, but could not mount an offer that surpassed the Bengals.) With a mouth that always found the microphone, Boomer quickly established himself as a presence in the locker room as Ken Anderson entered his twilight years with the franchise. He was my arch nemesis in the classic AFC Central, and always put up big numbers and games against the Oilers. Ironically in his rookie season he started his first game against the Oilers, in which he guided Cincinnati to a 13-3 victory over Houston. It was head coach Sam Wyche’s first year, and he and Esiason’s fates would be tied at the hip to each other during their time in Cincinnati. With Wyche, a former quarterback himself and an apostle of the Bill Walsh West Coast System, Boomer provided the new blood to reinvigorate the sagging Bengals franchise. 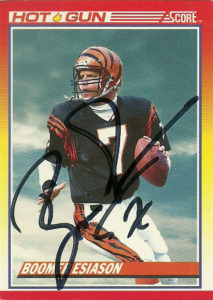 Esiason became the face of the franchise as the team gave him playmakers in the shape of Anthony Munoz, James Brooks, Tim McGee, Eddie Brown, and Rodney Holman. With a lightning delivery and a devestating understanding of the innovative no-huddle offense (that Buffalo later employed full-time after witnessing the effectiveness of Esiason under center,) the Bengals quickly climbed the ranks of the AFC during the last days of the most brutal division in all of football. 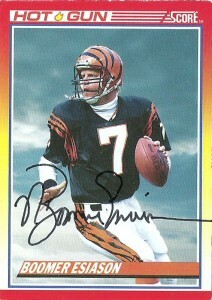 In 1986 he guided the Bengals to a 10-6 record throwing for a shade under 4,000 yards, and 24 touchdowns. 1988 saw the final ascension of the Bengals to Super Bowl XXIII, where they lost to the 49ers in the last final minutes of play. 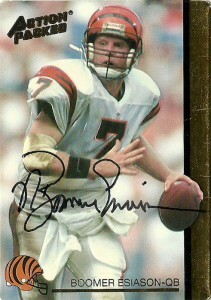 It was Boomer’s most prolific season as a pro, with a 97.4 quarterback rating and he was named the NFL MVP. By 1991 free agency, sacks, and injuries began to catch up to the Bengals. Esiason posted a 3-11 record as a starter and combined with new management, Sam Wyche was fired at the conclusion of the season. New ownership felt new blood was needed and rookie head coach David Shula (son of Dolphins head coach Don Shula) was brought on board to handle the team. Immediately he decided to fix the offense by letting many of the team’s playmakers go, and drafted David Klingler to be the heir apparent to Boomer. The writing was clearly on the wall for Esiason, and after another mediocre year behind the Bengals patchwork line and bland new offense, he was unceremoniously traded to the New York Jets in 1993 for a third round pick. As the starting quarterback for the Jets, he was able to give the offense a certain level of credibility over the next 3 tumultuous seasons under 3 different head coaches. Holding firm he posted an 84.5, 77.3, and a 71.3 quarterback rating over those seasons with the team. Despite having more touchdowns to interceptions in each of those seasons, the Jets slumped, and Esiason signed with the Cardinals, playing there one season in 1996. In a game during that season over the Redskins he’d throw for 522 yards in a game, the third most in NFL history. 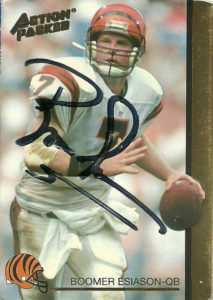 1997 proved to be Boomer’s final season, as he indeed proved you can return home, and came back to the Bengals. It was a great ending for him, coming in as a backup to Jeff Blake. After Blake succumbed to injury, and the franchise was sitting at a woeful 3-8, Esiason came in leading the charge, posting a 4-1 record over the next 5 games, and a 106.9 QB rating. He’d retire after the season, and is considered the most prolific left handed quarterback in NFL history. In addition to his broadcasting and radio duties, Esiason spends much of his time with charity, and the Boomer Esiason Foundation, helping with research into Cystic Fibrosis. You can visit his website at http://www.boomeresiason.com/index.htm.